The Industrial Design Centre (IDC) at Indian Institute of Technology, Bombay (IITB) is one of India’s premier incubators, where innovation, creativity, and uniqueness of thought and action are nurtured and actualized. Every year a fresh batch of creative minds and buzzing brains graduate from IDC, IITB, where various aspects of the urban developmental fabric are explored, dissected and re-built with new thought and up-to-the-minute approach. Whilst many of these innovations see the light of day, a lot of them remain unnoticed or get their due at a later date, after much improvisation, debate and struggle. 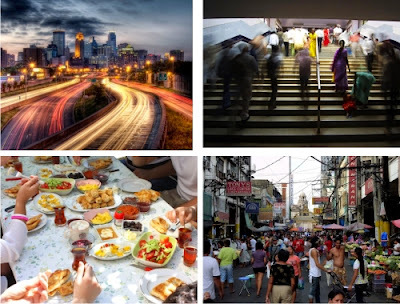 IAnD presents 4 student’s prototypes that make their mark on the urban fabric – irrevocably influencing the masses. Student: Anshumali Baruah, Architect from SPA, Delhi. Hectic lifestyles of majority of working couples makes daily vegetable shopping an inescapable, mundane and tiresome chore. Here is a system design solution that will empower local vegetable vendors to provide quality service for a better consumer experience, and equip them with an uplifted business model. The principle: When it comes to consumption of vegetables, consumers need assurance across the factors of time, cost, quality, variety, trust in vendor, nutrition and minimal wastage. In keeping with varying nutritional needs of each family, the system can suggest repeated usage and consumption in a shopping list and provide constant feedback about service and quality. It allows for choice of market, vendor and filters can be applied across entire range of vegetables. Ditto for payment and flexi delivery timings. Envisioning a local delivery network, the system can be another small step in enhancing one’s lifestyle. 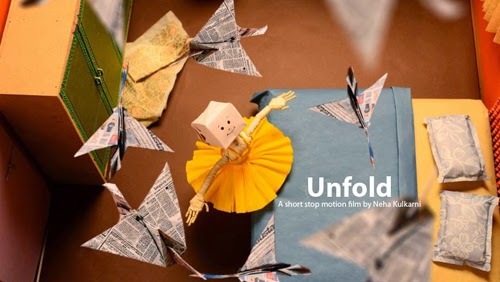 “Unfold” is a paper stop-motion animation short film. It can be called a material animation because of its usage of origami and most of its characters made out of paper. The story is of a hearing-impaired girl, based on true events and experiences from the author's life. The film is shot using stop-motion technique with the help of a DSLR camera. The principle: “I wanted to communicate the emotions of hearing impaired people including the exceptional visualization power they have due to prolonged concentration ability and good imagination,” explains Neha. “As an animator, I mixed different techniques and media like photography, paper and 2D traditional animation to make the movie. Student: Nabarun Bhowmick, BE Electronics and Telecommunication. 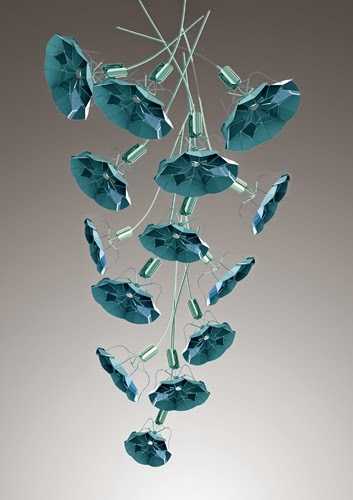 The product is a touch sensitive origami inspired flower, which is used as an single unit for the installation, where several such flowers can be developed as OLED Lamps. The lamp operates with simple touch and the intensity of light is controlled, determining the extent to which the flower unfolds. The principle: Exploratory in nature, the project attempts to understand kinesthetic properties and portray it through a dynamic sculpture. The form of the reflector is abstracted from the Electric Ray fish. This helps the light to have a wider spread. The pole transforms from triangular to circular at the base in a modular format, where the reflector and pole can be individually wall-mounted. The lighting system consists of three segments - security or visibility, cultural or advertisement and the path lighting segment. A transparent slit in the centre of the pole facilitates the advertising zone. The principle: The lighting system limits upward light and directs it only where it is needed. Not only does this have a positive environmental effect, it also improves the efficiency of the lighting. Besides the above, there are several students' works - Mugdha Kale’s way finding and signage for Dadar railway station, Mumbai; Namita Maheshwari’s bus stop for the IITB campus and a host of others that challenge the status quo and offer solutions at large. Visit http://www.ddsidc.com/2013/#/projects/ for an overview of the types of projects being undertaken at IDC.